Based on Vincent Bugliosi's book, Four Days in November, the film Parkland chronicles the events following the assassination of JFK. What I liked about this film was how it tells a part of the story that isn't widely known. 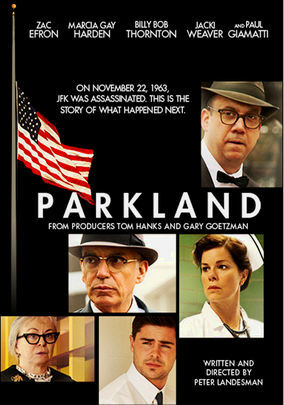 From the doctors at the hospital, working on the President, to the acquisition of the Zapruder film, Parkland goes behind the scenes to tell the untold story. I was also impressed with how the film managed to stick to the facts and not dwell on any of the conspiracy theories that surround the case. Zac Efron stars and really wasn't all that great. I think that Efron needs to stick to what he does best, taking his cloths off and making people laugh. While the film is kind of slow, I really enjoyed Paul Giamatti's portrayal of Abraham Zapruder, the man who filmed the assassination. Zapruder really struggled with releasing the tape to the media and the events he witnessed ultimately destroyed his life. Giamatti's portrayal of the man is supposedly spot on and truly deserves an honor mention. Parkland gives us a lot of new information about the events that followed the assassination of President Kennedy, but a lot of it are things the general public really aren't that interested in learning about. For a Kennedy aficionado, this film must of been eye opening, as for the rest of us, it was an interesting, non-bias view of history, albeit a little boring.